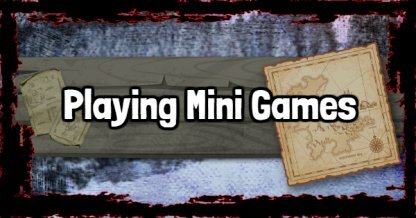 Passing the time in Red Dead Redemption 2 is easy when playing mini games! Read this guide to learn how to play poker, blackjack, five finger fillet, dominoes, and their locations! Check Out Starter Tips For Beginners! 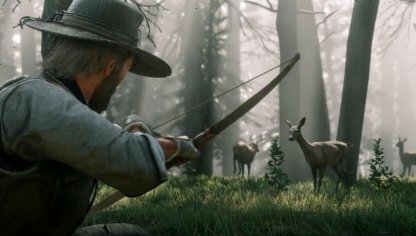 What Are Mini Games In RDR2? Mini games are side games that you can play to pass the time in Red Dead Redemption 2. They don't affect the story but provide a good distraction. Some mini games such as Blackjack, Poker, and Five Finger Fillet can earn you a bit of cash when you spend time playing them. The goal of Blackjack is to get cards from the dealer until you hit the number "21". Those with the closest card numbers to 21 will defeat the dealer and win the game. 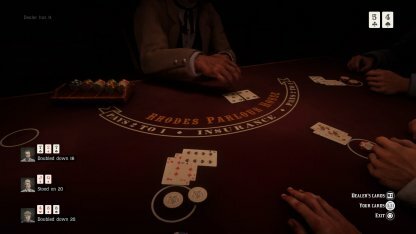 You can play Blackjack in the saloons in Rhodes & Blackwater. You can also play Blackjack with your fellow gang members in camp. Blackjack is simple but it is also a game of chance. Keep your card numbers between 14-18 as a buffer in case the dealer's secret card hits you with a high-point card number. 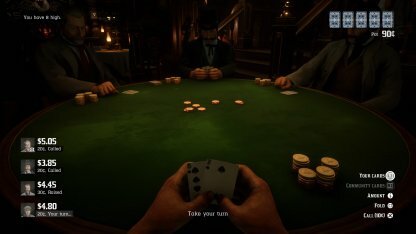 Playing Poker in RDR2 can be quite exciting. With a good hand, you can be confident in your bets but you can also bluff your way through even with a bad set of cards. There are poker tables in major towns like Valentine & St. Denis. You can also play and bluff against gang mates in camp. Five Finger Fillet is a game that requires good hand-eye coordination. Follow the sequence of buttons as fast as you can to win. Check Out Playing Five Finger Fillet With Micah! 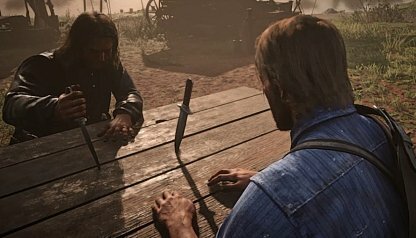 You can play Five Finger Fillet in camp or in towns or outposts like Strawberry and the Van Horn Trading Post. When it's your opponent's turn, be sure to watch the sequence of buttons between their fingers. You'll need to follow this to successfully complete laps. When playing this game, you simply need to lay down a domino with the same number. The goal is to empty out your hand of dominoes before your opponent does. Check Out Playing Dominoes With Tilly! 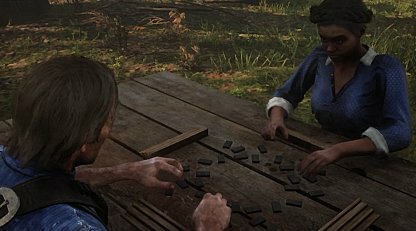 You can play Dominoes in St. Denis or Blackwater. You can also play this game in camp. 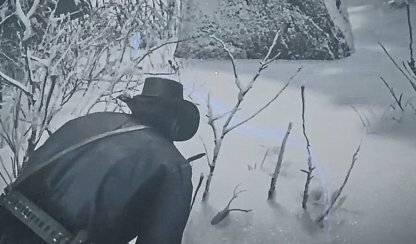 Hunting is one of the most lucrative & important mini games in RDR2. The materials and meat you receive from hunting can be sold for money or used as provisions in camp. 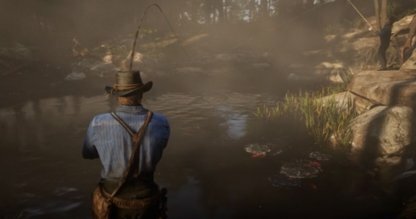 In the world of RDR2, you can hunt for legendary animals that can be skinned for very valuable pelts. These can be turned into materials for talismans. You can use your Eagle Eye to look for and follow animal tracks. This is extremely useful if the animal your hunting moves fast or camouflages really well. 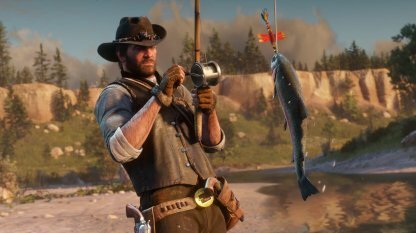 Fishing is another productive mini game in RDR2. The fish you catch can be sold for money or donated to camp as provisions or supplies. Fish will nibble a bit before taking a bite of your bait. Wait for them to pull down strongly, you'll feel a distinct vibration on your controller, then quickly push the "Hook Fish" button.